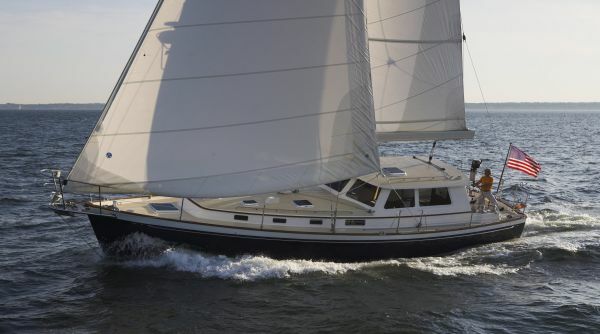 The Bruckmann 50 MKII is a no compromise motorsailer. This Mark Ellis design offers performance that outpaces sailboats and trawlers in her size range. With an optional 200HP John Deere diesel this boat powers along at 9+ knots. Reaching in approximately 15 knots of wind she will comfortably sail at 10 knots. The Bruckmann 50 MKII can be driven from the cockpit or the inside steering station which has 360 degree visibility and is comfortable in any weather. The Bruckmann 50 MKII has an extended swim platform which provides additional waterline for better performance and additional storage. Mark Bruckmann is a second generation boat builder. 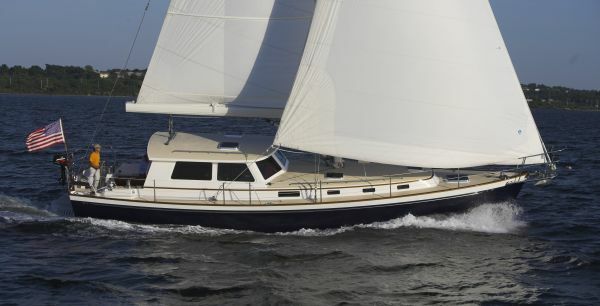 The Bruckmann Yachts are quality construction with modern systems and classic good looks. The Bruckmann 50 MKII can be customized to meet your requirements. Below is a description of the standard layout. 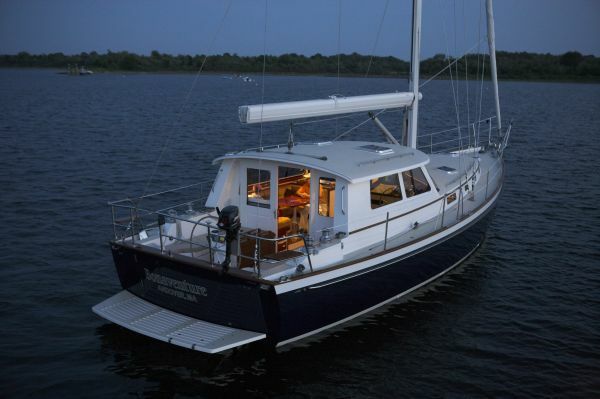 Starting forward, the Owner's Cabin has a large V-berth or Island berth with a Temperpedic mattress. There is anchor locker access at the forward end of the berth. An overhead hatch provides light and ventilation. Above and outboard of the berth are six louvered lockers for storage. There is a large cedar-lined hanging locker and drawer storage under the berth. To port in the Owner's Cabin is a vanity with mirror and seat. The Heads are located on the port side. Access to the owner's head is from the forward stateroom or the hall. It is equipped with a stainless sink, Corian counters, and VacuFlush head. Next aft is a separate stall shower, which can be accessed from the guest's or owner's head. The shower is designed with a seat and telephone-style shower. There is a teak grate and a storage locker. The guest head is accessed from the hall and can be used as a day head. It is equipped like the owner's head. A Guest Cabin is located to starboard. It has a full-size berth, a hanging locker, and lockers above the berth for storage. An opening port and overhead hatch provide light and ventilation. Stainless steel Danish cabin lights. Cedar ceiling strips on the inside of the hull. Moving aft to starboard is the Den/Library. This features an L-shaped settee. The outboard settee can be used as a sea berth. On the forward side of the Den are two large lockers that has a full-size Meile washer and dryer. Above the washer-dryer is a mahogany desk with a flat-screen TV and entertainment center. A customized organizer and fold-down writing desk are outboard of the TV. The TV and washer dryer are both hidden away when not in use. Overhead hatch and opening ports add light and ventilation to this beautiful and efficient area. Directly across from the den/library is a full-size, modern Galley. The galley is U-shaped and spacious enough for several people to cook. A large cold plate refrigeration system has both top loading and side door access. The extra large refrigeration has separate compressors for the freezer and fridge. A microwave is located above the refrigeration. The stove is a Force 10 with an oven and 3 burners. The under mounted stainless sink has a Barkar/Scanvick pressure water faucet and fresh and salt water foot pumps. Leaded glass lockers provide storage above the refrigeration area. Mahogany drawers and louvered lockers provide plenty of storage. Natural light and ventilation are from opening hatches and ports. Counters are all a light-colored Corian. Steps lead up the Main Salon and also offer engine room access. The raised salon provides a 360-degree view of the outdoors. A raised settee on the port side is comfortable and offers an exciting view of all the action. 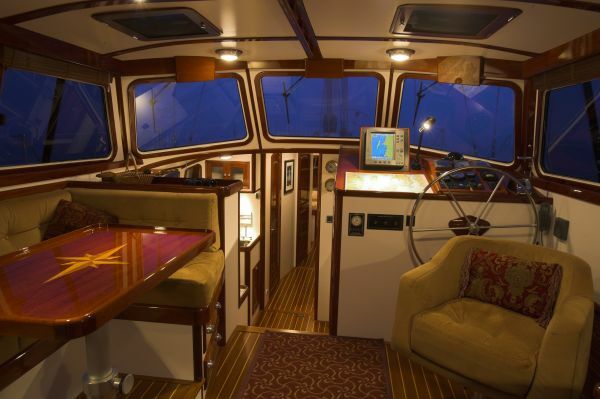 This also converts to a spacious berth by lowering the custom varnished mahogany table. Cushions are stored nearby to fill the space over the table. To starboard is the inside steering station with full controls and electronics. Steering is hydraulic at the inside station. Two custom chairs flank a mahogany table on the starboard side. The forward chair raises and turns providing a comfortable helm seat at the inside steering station. The side windows slide open and all have screens. All windows and hatches overhead have Oceanair shades and screens. A teak and holly cabin sole is finished bright and is found throughout the interior. A Herreshoff style finish features white bulkheads and overheads with bright mahogany trim and mahogany doors and lockers. All hardware is top quality stainless. 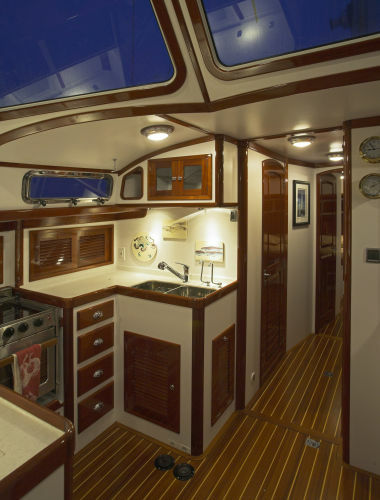 The interior is elegant and cheerful with a lot of the details found in a traditional yacht. CONTACT CHUCK HOVEY YACHTS SEATTLE OFFICE - THE WEST COAST REPRESENTATIVE FOR BRUCKMANN YACHTS at 206-624-1908. *Required. *Required. 4 + 4 = Wrong verification number!